Jan Weenix or Joannis Wenix (between 1640/1649 – 19 September 1719 (buried)) was a Dutch painter. He was trained by his father, Jan Baptist Weenix, together with his cousin Melchior d'Hondecoeter. Like his father, he devoted himself to a variety of subjects, but his fame is chiefly due to his paintings of dead game and of hunting scenes. Many pictures in this genre formerly ascribed to the elder Weenix are now generally considered to be the works of the son. It is not very sure if Weenix was born in Amsterdam; also his date of birth is not exactly known. The year in which his father died is also a puzzle. The family lived in a castle outside Utrecht, but his father died young after he went broke. Weenix was a member of the Utrecht guild of painters in 1664 and 1668. By the age of twenty Jan Weenix rivalled and then subsequently surpassed his father in breadth of treatment and richness of colour. In 1679 when Jan Weenix married the 20-year-old Pieternella Backers he told the schepen he was "around thirty"! Between 1680 and 1700 they had 13 children baptized in a hidden church. At least three of them died young. In 1697 he painted a portrait of Peter the Great, visiting the Republic to study shipbuilding, science and the art of fortification building. In Amsterdam Weenix was frequently employed to decorate private houses with wall-paintings on canvas. One was near the Admiralty of Amsterdam. The mansion, on a canal with many rich Sefardim, with a view on the park and into a long avenue, was owned by a Spanish merchant, involved in sugar plantations in South America. The five fixed paintings or wallpaper on canvas became very popular in the second half of the 18th century, when nature and Rousseau were fashionable and copied. The paintings survived in the house until 1922. Then the enormous "paintings" were sold before an auction to William Randolph Hearst in a private arrangement. After Hearst went bankrupt, the paintings were dispersed; one is in the National Galleries of Scotland in Edinburgh, two are in Hotel Carlyle in New York, one has been in the Allen Memorial Art Museum since 1953 and one is lost. 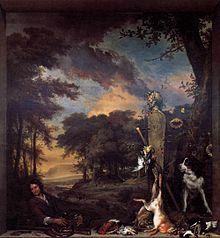 Between 1702 and 1712 Weenix was occupied with an important series of twelve large hunting pictures for the Elector Palatine Johann Wilhelm's castle of Bensberg, near Cologne. Also Eglon van der Neer, Rachel Ruysch, Adriaen van der Werff had a very good relation with the court, being paid well or knighted as ridder and most probably meeting an international crowd of artists and musicians. The treasury was empty when Jan Wellem, as he was called in Düsseldorf, died. Most of this collection is now at the Munich Gallery, but the paintings of Van der Werff moved to the cellar. His pupils were his daughter Maria Weenix and Dirk Valkenburg. Jan Weenix lived towards the end of his life in a house on the Amstel river, and was buried in Nieuwezijds Kapel a nearby church on the Rokin. ^ Lawrence Gowing, ed., Biographical Encyclopedia of Artists, v.4 (Facts on File, 2005): 721. ^ a b c Chisholm 1911, p. 467. This article incorporates text from a publication now in the public domain: Chisholm, Hugh, ed. (1911). "Weenix, Jan Baptist" . Encyclopædia Britannica. 28 (11th ed.). Cambridge University Press. p. 467. This page was last edited on 12 August 2018, at 05:57 (UTC).